Aries man in love personality traits show his utter precociousness, curious about everything and direct in his statements and questions. This leads to the Aries man breaking apart old pieces of equipment, clocks, electrical devices, that sort of thing, all just to see how it works and sate his curiosity. The Aries man in love characteristics show that as he gets older the Arian male will see his attention turn to the fundamental processes of life and interactions, making him an expert at the fundamental tools of tactics. Oddly, it leaves him somewhat more bereft of a strategically astute mind. Because of this the Aries man in love traits show he will concern himself with applied skills, not theoretical. Therefore he will turn his mind to engineering rather than theory, programming rather than mathematical theory. 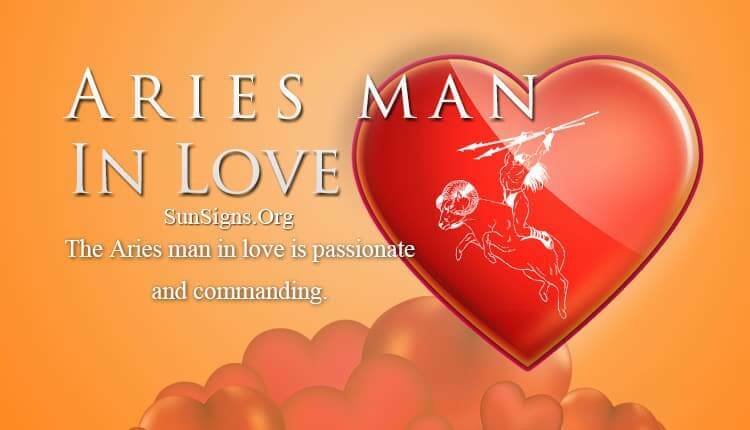 The Aries man in love personality is passionate and commanding, carrying a lot of the traits of traditional masculinity. They can, under the right circumstances, be prone to acts of violence and relentless overbearing. In a relationship, Aries Men will dominate the relationship, taking the lead in all actions and decision making. His personality will be a blazing light in social-circles, as Aries is the ultimate extrovert. This also means that if the Arian can’t fix the situation with his hands, he’s not going to be spectacular at resolving the issue. So subtle things, emotional issues, those things that are not entirely physical but are more ephemeral, will have him frustrated and wringing his hands. He doesn’t understand how to fix things he can’t fix, and it’s one more nod to his traditional masculine values. Once this frustration is passed, and you can get him to start understanding you, there is no one so passionate and devoted to his emotions as the Aries male. The Aries man in love characteristics show his tolerance at this point is only matched by his forthrightness. He will be patient with you and your struggles if only because he knows that he himself is no piece of cake to work with. So while he is not terribly sensitive or passionate, he is in fact enduring. He will be prone, as all Aries are, to having many projects and lots of ideas that keep him fired and active. Always trying new things and seeking new experiences, he will very much want his partner to be along and involved in all of his projects. He knows his adventures are best shared, and who better to share them with than his best friend, his lover. Dating an Aries male will almost inevitably result in you dating someone who is unerring confident and self-assured. The Aries love compatibility shows he is sure of his virility and masculinity. And this can sometimes lead to him being more than a bit of a traditional chauvinist. Additionally the Aries man in love personality strives for the top, especially in circumstances that permit him to be actively physical and mentally energetic. In his ownership of his virility, he can overindulge in sexual adventures, so expect to have an active and healthy relationship with an Aries man in bed. The Aries man in love personality traits show that keeping the Ram feeling that you will always share his adventures and projects, knowing that you will stand with him without letting your fears get in the way, is the best way you can hope for to lure the Aries male into marriage. No worries about him thinking of it as a trap, he’s not at all hostile to the idea, but he does know that he requires that fierce warrior of life to stand with him. But for all his ferocity, the Aries male lover prefers his women to be the very depths of femininity. They will be somewhat turned off by one who makes no nods to those principles. The Aries man in love traits show that the best soul mate for him is a balance of the feminine, and the tom boy, one who can be beautiful and delicate while simultaneously getting her hands dirty and tramping across hillsides. To be in love with an Aries male, you simply must understand his passions and share them. Know that if you truly win his heart, you will be seen as his greatest adventure. And he’ll want to ride that adventure out to see what lay at the journey’s end. The compatibility with an Aries man can be a lot of work, but in the end, it will always wind up being worth it. Be ready for a life full of passion, adventure, and probably more than a few odd twists and turns in your path.